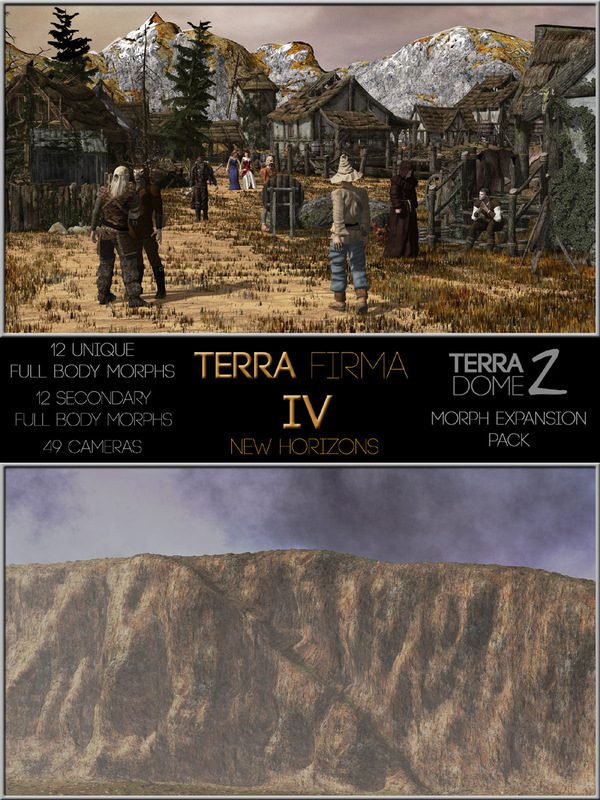 This brand new set of 12 unique full body morphs will help expand your TerraDome2 settings in new and diverse ways. From the imposing cliffs of Landsedge, to the slight undulations of the Gentle Hills, this set brings new vistas to let your imagination soar in. Use these morphs in combination with each other or existing TerraDome2 morphs, to create a stunning selection of outdoor scene settings. When using these morphs on their own, you can also take advantage of the included secondary morphs. These are intended to be used on a second instance of TerraDome2, or additional AZone and/or BZone. Each Full Body Morph has a corresponding secondary morph, which varies very slightly, When using a different material on the second instance of TerraDome2, this can be used to create contrasting definition.